London, 1501. 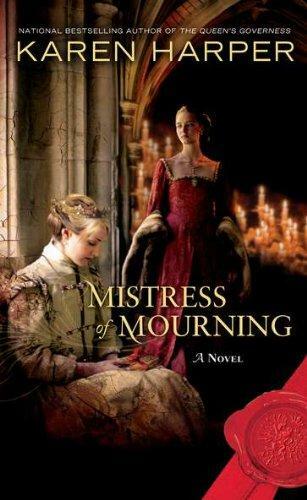 In a time of political unrest, Varina Westcott, a young widow and candle maker for court and church, agrees to perform a clandestine service for Queen Elizabeth of York, wife of Henry VII–carve wax figures of four dead children, two of her offspring lost in infancy and her two brothers, the Princes of the Tower, whose mysterious disappearance years ago has never been solved. Karen Harper is a USA Today–bestselling author whose novels, both historical and contemporary, have been published worldwide. A former college and high school English instructor, Harper now lives in Columbus, Ohio, and Naples, Florida, and frequently travels around the country to promote her books and speak about writing. Whom did you find the most interesting character in Mistress of Mourning? Who would ever expect tyrannical Henry VIII to have had such a beautiful, loving mother? Do you know of children who have turned out very differently from their parents, in personality, values, and general attitude toward life? Does a parent really have so little influence over his or her children? If Prince Arthur had lived, how might English history have turned out differently? Viscount Lovell is identified as the villain of the novel early on, and we read to find out whether he can be stopped before implementing his plan to destroy the Tudor succession. What devices does Karen Harper use to create suspense around Lovell? Did you notice that although Queen Elizabeth has power, Varina has the freedom to act? Discuss the pros and cons of being royal versus being a commoner, for both men and women, during this time. Which would you rather be? Do you have any sympathy for Christopher Gage, Varina’s suitor? Is he justified in being angry when Varina finally turns down his marriage proposal? Do you have any sympathy for Viscount Lovell? When does faithfulness to a lost cause become terrorism? What line does he cross? What do you think happens to Nick and Varina after the book ends?